Call this a destination run — but if you have a free afternoon or evening, it’s worth the 20 minute drive off west of the highway to enjoy a run and a meal in Half Moon Bay. This is a gorgeous coastal town, home of a famous surfing beach called Mavericks. 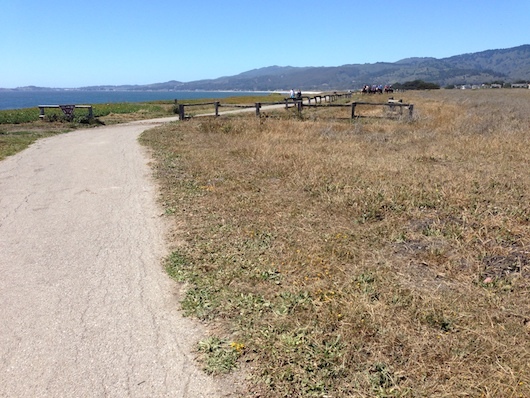 The run that’s worth the detour is the coastal trail, which runs some eight miles between Half Moon Bay State Beach and Pillar Point Harbor. The trail north of the State Beach is more rugged. The coastal trail runs above the beach, with great views to crashing surf and the cliffs to the north. It’s a combination of paved and soft surface. The trail passes several beaches, heading south — which are themselves quite runnable in the right conditions. The full route is 4.2 miles one-way, but can easily be shortened — just turn around! For a challenge, and variety, there are some roads heading up into the hills, east of Rt.1: Do a quick loop on Higgins Canyon Rd., or head up Purisima Creek Rd. Before or after your run, if you have time, check out the town and Main St., which is filled with fun shops and great restaurants. You need a car to get to HMB, but it’s a quick 20-minute drive down Rt. 92, which is well-signed from the highway.